Candidates who have passed Post Graduate Degree in the defined subjects with 1st or 2nd division are eligible to apply.The candidates must note that final year appearing/ Result awaiting students are NOT eligible to apply. Eligible candidates can apply online through official website www.joinindianarmy.nic.in from 16-05-2017 to 14-06-2017. #Fill the online Registration form after reading the instructions carefully. #After getting registered, click on “Apply Online” under dashboard. #A page “Officers selection- Eligibility” will open. 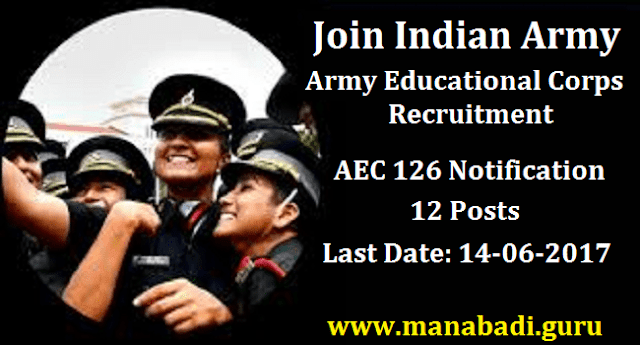 #Then click ‘Apply’ shown against Army Education Corps. #A page ‘Application form’ will open. Read the instruction carefully and click ‘Continue’ to fill details as required under various segments- Personal information, Communications details, Education details and details of previous SSB. “Save & Continue” each time before you go to the next segment. #After filling details on the last segment, you will move to a page “Summary of your information” where in you can check and edit the entries already made. #Then click on “Submit Now” only after carefully ascertaining that the correct details have been filled in. #take two copies of the application form having Roll No and other details generated by the System. Candidates will be selected based on Short Listing of Applications, Physical Standard, Medical Examination and Interview. 1.Short listing of Applications Integrated HQ of MoD(Army) reserves the right to shortlist applications and to fix cutoff percentage of marks for each subject without assigning any reason. After shortlisting of applications, the centre allotment will be intimated to the candidate via their email. After allotment of Selection Centre, candidates will have to log in to the website and select their SSB dates on a first come first served basis, upto a specified date. 2.Only shortlisted eligible candidates depending on the cutoff percentage will be interviewed at Selection Centres, Allahabad (UP), Bhopal (MP) and Bangalore (Karnataka) by Psychologist, Group Testing Officer and Interviewing Officer. Call Up letter for SSB interview will be issued by respective Selection Centres only through candidate’s registered e-mail id and also through SMS only. Candidates will not be interviewed locally. Allotment of Selection Centre is at the discretion of DG Rtg, IHQ MoD (Army) and NO request for changes are entertained in this regard. 3.Candidates will put through two stage selection procedure. Those who clear Stage I will go to Stage II. Those who fail in Stage I will be returned on the same day. Duration of SSB interviews is five days excluding day of arrival and details of the same are available at official website of Rtg Dte www.joinindianarmy.nic.in This will be followed by a medical examination for the candidates who get recommended after stage II. 4.Candidates recommended by the SSB and declared medically fit, will be issued joining letter for training in the order of merit, depending on the number of vacancies available. 1.Height & Weight. The minimum acceptable height and weight for men is 157.5 cms with correlated weight. Incase of candidates belonging to the North East and hilly areas like Gorkhas, Nepalese, Assamese and Garhwalis, the height will be relaxed by 5 cms and weight commensurate with reduced height. In case of candidates from Lakshadweep, the minimum acceptable height can be reduced by 2 cms. 2.To pass fit, a candidate must be in good physical and mental health, free from any disability. 4.Prospective candidates are advised to exercise and keep themselves physically fit, in order to avoid any injury due to the rigorous physical training at Indian Military Academy. In order to be able to adjust to the regime there candidates are advised to achieve following standards before joining the IMA, if finally selected:- (a) Running 2.4Km in 15 minutes (b) Push ups – 13 Nos (c) Sit ups – 25 Nos (d) Chin ups – 6 Nos (e) Rope climbing – 3-4 metres. also note that Review Medical Board (RMB) will be granted at the discretion of DGAFMS based on the merits of the case and that RMB is NOT a right. Candidates will be considered medically fit only on receipt of the approved Medical documents from Directorate General Medical Services. Duration of training is one year at the Indian Military Academy, Dehradun. #Selected candidates will be detailed for training at Indian Military Academy, Dehradun according to their position in the final order of merit up to the number of vacancies available in each subject. #Candidates will neither be allowed to marry during the period of training nor will he be allowed to live with parents/Guardians. A candidate who marries during training shall be discharged and will be liable to refund all expenditure incurred on him by the government. A candidate, who marries subsequent to the date of his application, though successful, will not be selected for training. #Cost of Training. The entire cost of training is at Government expense. In case the GC is withdrawn from training academy due to reasons other than Medical ground or the reasons not beyond his control, he will be liable to refund cost of training @ Rs. 9488/- per week (or as notified from time to time) for the period of his stay at Indian Military Academy.